Just like Prime Minister Theresa May over in the UK, it would now appear that President Macron of France is also doing everything possible to remain in power. If financial analysts are to be believed, all Mr Macron’s promises to the ‘yellow vests’ movements could mean that France cripples the EU budget rules, which would make a world of difference for anyone wanting to criticize Italy for doing the same. He's offering crumbs, but we want the whole ‘baguette’ is how one of the gilets jaunes (yellow vest) protesters expressed their anger over the government’s decision last week to postpone the planned fuel tax rise. 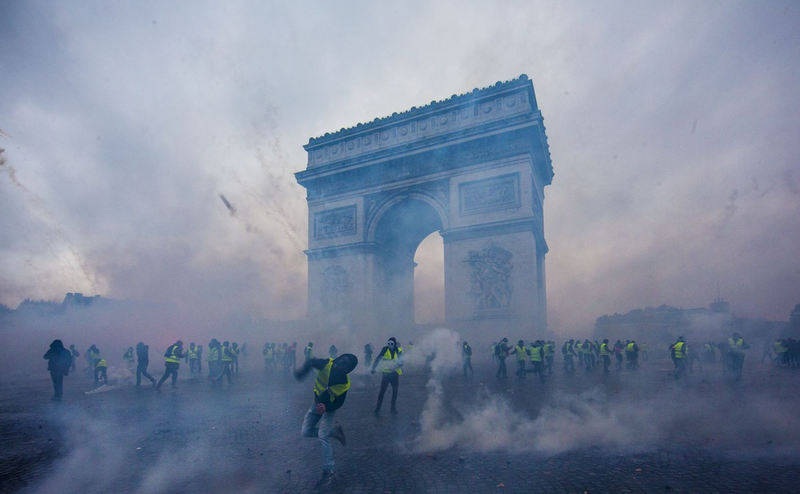 After the protesters showed up in great numbers again this Saturday, President Macron gave in and made several promises during Monday evening’s speech. The problem is that all those promises can now cost the EU dearly. Attempting to gain control over the vests protests, French President Macron distributed a series of ‘douceurs’ (painkillers) for those in the lowest incomes bracket: the minimum wages will increase, the lowest pensions are spared from an already planned tax increase, overtime is no longer taxed and the government urged employers to reward their staff tax-free with an end-of-year bonus. Related coverage: France – Macron Raises Minimum Wage, Asks Calm To Return. Earlier, the government also had to delete the announced increase in fuel taxes (part of the Paris climate agreement) to curb the 'yellow rage'. For President Macron it is a humiliating retreat. He acted as the reformer who, unlike his predecessors, would not be put off by the traditional French street protests. But in the end he did. Furthermore, the trouble could get worse as, according to French experts, the yellow vests promises will cost the state at least 10 billion euros. Just by suspending the increase in excise duties on petrol and diesel, the state treasury is missing over 4 billion euros. The pension measure costs almost 2 billion, the increase in the minimum wage 1 to 2 billion and by removing the tax on overtime the tax authorities lose another 1.7 billion. In addition, there will be another setback of an estimated 4 billion euros because, according to Finance Minister Bruno Le Maire, the French economic growth will be lower as a result of the yellow vest protests. The result is that France will end up next year again with a budget that goes against what the EU normally allows. Instead of being able to criticize Italy, Mr Macron will now be on the receiving end of criticism himself. President Macron, a former banker, had been pointing out in the past few months that the French budget deficit would this year for the first time in ten years remain within the 3 percent EU standard. For Paris that was a big achievement. Ever since the introduction of the stability pact some 15 years ago, France has met the European budget requirements only four times. It now looks as if the budget deficit will now rise to 3.5 percent of GDP, well above the 2.8 percent recorded by France this year. That is a heavy blow for banker Macron, who thus does just as bad as his socialist predecessor Hollande . The northern European countries are now fearful that France will once again become part of the so-called 'Club Med', as the southern budget deficit countries are sometimes scornfully called (Italy, France, Spain, Greece, Portugal all border the Mediterranean sea). The reversal of the new petrol taxes has lastly also seriously damaged Macron’s position as a champion of the Paris Climate Agreement. So happy we are not involved in the paris agreement shitshow any longer.